All types of crickets can become a nuisance when they take up residence behind your walls because of their loud noise. Crickets don't bite humans or animals, but they may damage your plants, building material and fabrics by feeding. 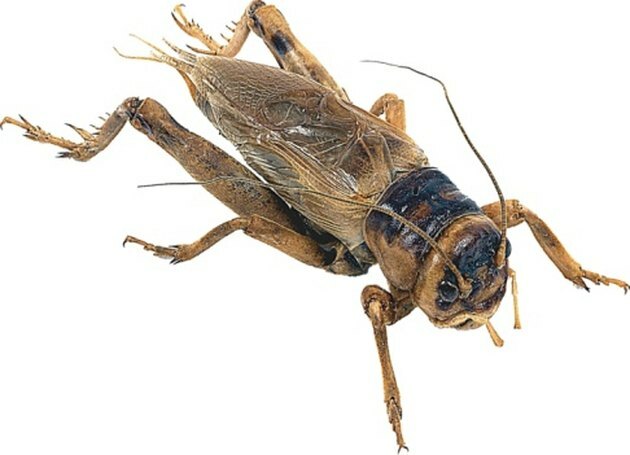 If the crickets in your home hide behind appliances in walls, you may be able to kill them by distributing an insecticide in the wall cavities or by inviting them out to eat poisoned bait. Crickets sometimes nest in the spaces between the walls. Caulk all holes and cracks in the exterior walls of your house to prevent more crickets from coming inside. Focus on areas around the foundation, doors and ground-level windows. Pour about 1/8 tsp. of cornmeal in the center of a sticky board trap. You can get this trap at a hardware store. The product label may say that it is for mouse control. Place the sticky trap near the appliances where you suspect the crickets are. Check the sticky trap every day. Discard the trap when it's full and replace it until you no longer have any cricket problems. If the sticky trap does not catch any cricket in two days, you may have to resort to other methods. Move the appliances that cover the infested wall and drill a hole in the wall that's about 1/4 inch in diameter. Apply diatomaceous earth through the hole into the wall spaces. This white powder is sharp fossil shells that will abrade the crickets' shell, drying them out. Apply an insecticidal dust through the hole if the diatomaceous earth doesn't provide enough control. Can Roaches Live Inside Your Walls?